This is the other part of the 2-volume The Legend of Heroes artbooks. I like this one better because it the characters plus the setting, so there's really more meaning to the illustrations. The Legend of Heroes: The Characters has only characters and there not much insight into them. 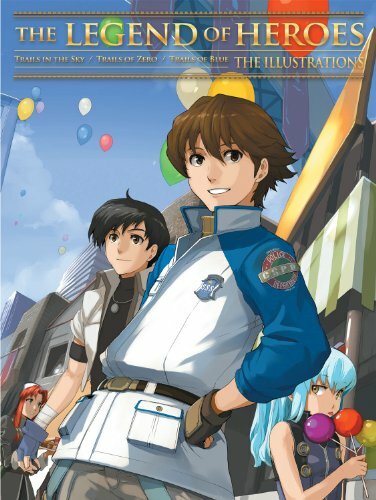 英雄伝説 空・零・碧の軌跡 THE イラストレーションアートブック is the original Japanese artbook for this book and that was released in 2012. This English edition is translated by Udon. Just like the other artbook, this is equally thick at 272 pages. The art is great. Many are huge artworks printed to the edge. Backgrounds are beautiful with a lot of different settings. Also included are some event artworks and designs for the mechas and vehicles in the game. There are no captions other than the title of the artwork. Again, this book received rather mixed reviews on Amazon Japan. One gave 3 stars just because there are no commentary. Anyway, I give this book 5 stars for the art.